In Napoli, a city obsessed by superstition, shrines and shadowy catacombs, All Saints day (1st Nov) and All Souls day are opportunities to pay respects to deceased relatives by visiting graves. Older, alarmingly morbid practices are still carried out where church crypts are lit up and coffin lids are opened or removable glass panels taken out so that the relatives of the decaying can see their faces, caress the corpses and make the sign of the cross over their head. This of course, is no longer common practice and remains a ritual for the religiously devout. 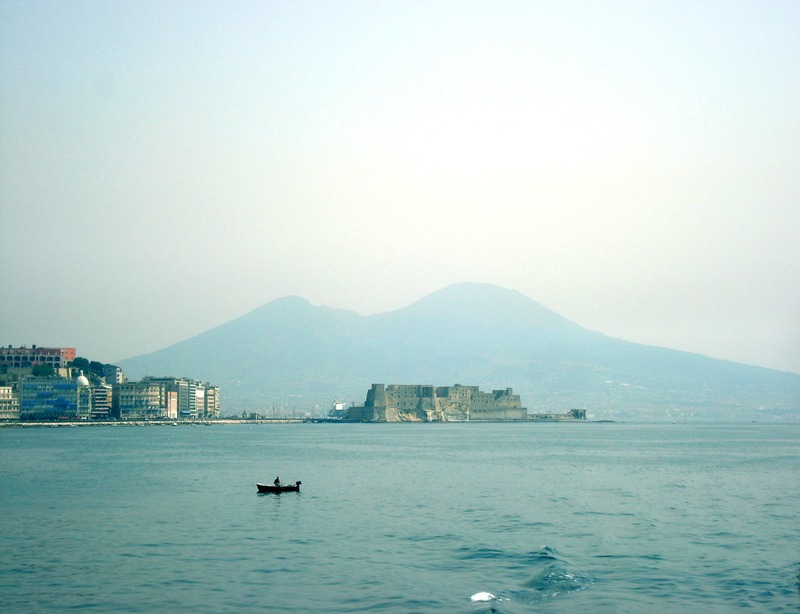 Napoli – A city whose dark alley ways and underworlds shroud it in mystery. With such a deep rooted connection and respect for the dead, the Neapolitans, as the every occasion, create edible offerings. Around the time of the festival sugared skulls and skeletons appear in shops and stalls, tempting children for a pittance. I have made another sweet treat usually associated with the occasion, Torrone dei Morti (Torrone of the dead), in which layers of chocolate and nuts give a sweet taste to an otherwise bitter remembrance. The idea is to construct a layered block in a loaf mold, turn it out and cut it into slices. I used a silicone loaf mold for ease and smoothness of surface, otherwise line a regular loaf tin with cling film. Melt 150g dark chocolate in a bain marie. Keep the water just below simmering point; if the chocolate is melted at a low temperature and cooled rapidly, the resulting surface will be shiny. Once melted, pour into mold and tilt until all sides are coated. Naturally chocolate will be thicker on base, yet as it cools and thickens continue to tilt so chocolate is more or less even on all sides. Place into fridge to cool rapidly, chilling until solid – it’ll only take about 20 minutes. Meanwhile, melt white chocolate and add peanut butter, chopped almonds and half of the ground almonds, mixing thoroughly. Pour into the same mold and place back into fridge. Mixture should it to about halfway. Leave to set for an hour then make next layer. Melt milk chocolate then add Nutella, chopped hazelnuts and the rest of the ground almonds. Pour over first layer. Leave overnight to cool and solidify. The next day, melt remaining 50g dark chocolate and pour over what will be the base, again leveling by tilting to and fro or smoothing with a spatula. When this is set, turn block out onto a board. Cut into inch thick slices with a very sharp knife and lots of force. Inevitably, some of the Torrone will crumble on being sliced it doesn’t take away from the fact it will be amazingly delicious!! Why not wrap slices and gift them for All Souls day / Halloween.